Yesterday someone mentioned having an evening nanny. I was wondering if this nanny provided pick up and transportation from daycare. This is precisely what I would like to have! However, when I have approached potential evening sitters they would not do pick up and transport to our home. I had written this off as something that was just not done but perhaps I gave up too soon? Does anyone here have a sitter than provides pick up and transport for preschoolers? Can you tell me how you found them and approx. how much you pay them? The only other non-parents I see at pick up and drop off are grandparents. We have hired nannies who will transport through College Nannies and Tutors. I have never heard of this org – thanks for this! They service my area, and I will look into them for after school pickup when my daughter enters pre-k! As for the original OP – we actually hired a teacher at my daughter’s preschool to take our daughter home 2x a week. We pay her an hourly rate from when she leaves school until 7pm (when we’ve told her we’ll be home). We did the same– hired a teacher to take our kid home several days a week. Just a heads up, each branch of College Nannies and Tutors seems to be run fairly independently. I really like their model (they’ll employ a nanny directly, which is unusual around here). I think this is fairer for the nanny and easier on the family. However, I had a bad experience. The one I tried sent a candidate was was lying, badly, about her qualifications. When I called out the lie to my contact there, she apologized, but we agreed to interview the candidate. The candidate proceeded to lie some more in the interview (also badly). The irony is that the lies were about qualifications that weren’t terribly important to me. However, I didn’t want a candidate who would lie or an agency that failed to screen out bad lies. We have had a pretty good experience with College Nannies and Tutors. One thing to note is that the candidates aren’t all college students, although many of them are. I specifically request someone who is looking for a job first, and is a student second (because I need someone who isn’t tied to the college schedule), and actually I interviewed several people who were not actually students. Whether that matters to you depends on your circumstances, of course, but just know that you can be pretty specific in your search (but it may take longer). Hello, yes, that was me. Our evening nanny does provide transportation. She works at the kids daycare so she just takes them home with her. On weekends if she sits for us she can also help with pickup and drop off. We provided one car seat and she already had some others from her kids. Thank you! This is very helpful.I think I will try and ask around again. If I can find a suitable person this will solve so many of our scheduling woes! It sounds like you need someone who drives so I agree to look for college students. I did something similar when I was in junior high/high school as an after school job but no driving was required because we’re in a walkable city. I’m the one with the original post – we have a nanny in her mid-40s that drives our kids. I think it’s very common in my area (large Southern city) where everyone drives. She used to drive them in her own car, but now that we have a third on the way we got a third car (ugh) and she primarily uses that. We just advertised for it at the time! Honestly she’s way safer of a driver than my parents or myself, I feel very comfortable with it. I just hired someone to do this! I hired a high school senior to pick-up my kids (bus ride is an hour+), drive them home, get a snack, play, start dinner and wait for me to get home around 6:00/7:00. I went through care . com, and had numerous responses (not in a big city). I was worried about the driving, but she will only be driving relatively small, easy roads and no interstate. We hired our nanny through care.com. Normal routine is that she gets the kids off the bus, but she also picks them up from school when they have after school things, or from the kindergarten wrap around program on weird early dismissal/no kindergarten days, and she drops them off at my husband’s office or at extracurriculars in the evenings as necessary. During the summer, she drove them to the pool or park all the time. It’s so convenient! We have this and got it for travel, but we use our plug in one. The speakers are better in an actual machine. This seems so deeply unnecessary. Why not buy a regular white noise machine like a LectroFan or a Dohm so you can re-use it post-kids (for guests, for travel, etc). Yeah, we had a sleep sheep that we got as a gift. I didn’t like it both because it has a limited time frame, but also since it turned off automatically at some point (the one we got didn’t plug in and I think would go for an hour max and then turn off suddenly, which would sometime be abrupt enough to wake the baby). We ended up getting a normal non-children specific sound machine that has been a lot better. omg, this was my problem with it too. Baby would wake up as soon as the sheep stopped making white noise. I’d sneak into her room to turn it back on. I did this for weeks (!!!) before coming to my senses and purchasing another white noise machine that plugged in and played all night. Bliss. +1. Also if you use an air purifier for white noise you get the added benefit of cleaner air. While I’ve put away the lamb portion, we still use the white noise portion nightly with my 3yr 2m old. And, it’s easily portable for travel. I used it as part of the night time routine – “ok, it’s time to turn on your panda!”. Also I thought it was cute, and now that LO is big enough to stand up and push the buttons himself he will play with it in the morning if he wakes up before us and is bored. We also used it for travel by taking out the “innards” and leaving the panda itself at home. It’s totally unnecessary though, I agree – white noise machines that are not baby specific or multi-function systems like the Hatch Rest are definitely superior. We use this for on-the-go naps. The velcro on the back attaches easily to her stroller or car seat. I wouldn’t pay for it myself, but we got it as a gift and it’s come in handy. we use an old iPhone. best idea ever. and if we travel, we an always use our phones and it’s the same sound (same app). Ok, soliciting recommendations. We have a 3 year old and a soon to be 1 year old. We try to use our single stroller wth the ride along board but this doesn’t always work out, esp. in the winter. Baby is too big for wearing without it being back breaking, so that’s not an option. We have the UB double umbrella stroller but it is so hard to push with two big kids now that it’s basically torture. Really we need something for school pick ups (which is a 15-20 min walk on city streets), but it would be nice if it was not a total pain to navigate in a supermarket, etc. Is this just impossible with over 50 lbs of kids? I’m considering the Joovy ultra light sit and stand, but worry it won’t be much easier to push than the UB double. Anyone have a solution? I don’t own the Joovy ultra light sit and stand but I have seen it at playgrounds and asked the parents about it because it looks awesome, and everyone has confirmed that it is indeed great. This was mostly during the summer, though, so I don’t know how it would fare in snow and/or bitterly cold temps if you’d want to use foot muffs or something for both kids. Thanks! Maybe I should just try it. Have you looked into the double Zoe? We have it and love it for 15-20 min walking commute to daycare(s), but kids are a little smaller than yours (5 months and 2). Looks like the wheels are a bit bigger than the UB double umbrella stroller so maybe it would be a better option? We’ve also had good luck with the double-wide Zoe with 50 lbs of kids, though in our case that’s two 25-lb 2-year-olds, which might be easier than differently sized kids. This absolutely does not meet the need for something you can take in the grocery store, but I use our Burley bike trailer + stroller attachment (or a wagon, but that’s probably not ergonomically ideal for every day commute) for 2-kid transport. It’s covered, has extra space for stuff, and pushes easily over almost any terrain. Every so often the kids get into a “HE’S TOUCHING ME!” mood, but usually they like sitting side by side. I had a Joovy UL sit and stand and hated it – I found it very hard to maneuver. I replaced it with the City Mini, and it was like night and day. It’s wide, yes, but it does fit through doorways and it is so much easier to push. Maybe look at the “full size” tandem double strollers? (Ex: UB Vista (used? ), Baby Jogger City Select, Britax B-Ready G3, Phil & Ted’s Sport.) Side-by-side is harder to navigate in the grocery store, and umbrella strollers just don’t have the structure it sounds like you need. They are pricey but you are logging a lot of time with it! Self-edit: Easier in the grocery store depends on your grocery store. Side-by-sides are wider but easier to turn. Tandems are harder to turn (because they’re longer and have weight out front) but the width of a single. I have both a sit and stand ultralight and a Britax double. The joovy is harder to steer one handed and is a rougher ride. The Britax has worse storage and no ride board. I loved the joovy when i had one kid that wanted to stand or sit in the bench. When both needed to actually be buckled in, the Britax is better (and fits through standard doors). I don’t live in a city, but last summer we went on multiple walks every weekend with our 2 and 3 year old with a combined weight of 50+ lbs. We walk up to a nearby strip mall and then around the neighborhood. We had a joovy ultra lite sit and stand, a zoe double side by side, and a Bob double jogging stroller. The Bob was by far the easiest to push (esp up hills! ), followed by the zoe, and then the joovy. However, the joovy is the one we used all the time and the one we have kept. The bob was just too bulky to store. The zoe is super light and was amazing when the kids were younger. But the joovy hits the sweet spot for us with regards to maneuverability and weight. It’s fairly easy to maneuver one sidewalks and solid ground, but hills are a bit of a challenge. The older kid likes getting on and off the back seat. He also really likes being able to stand up and look forward if needed. I caught it on ama zon for about 175. I think you are right that there is just only so much you can expect when you are pushing that much weight! double bob fits through doors (even though it doesnt look like it could) and is a tank for big kids. great for the neighborhood but it does not fit in my prius. Hope you’re still reading. I agonized over doubles for years. We use similarly to you (except not in grocery stores), and can not recommend the Mountain Buggy duo enough. It’s narrow enough to fit through any standard door. We bought it used and the seller demo’ed it with her 8 year old in one of the seats – it was cramped, but he fit. I loved this thing. 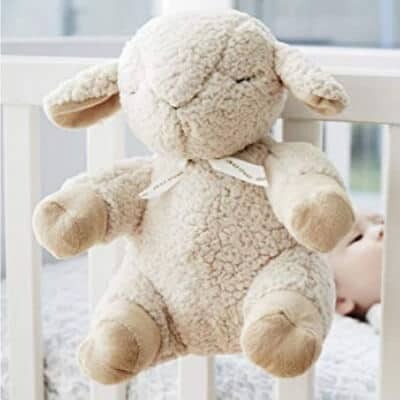 It was super convenient for sleep routines when we were traveling–sleep sheep in the car, sleep sheep in the hotel, sleep sheep in the stroller–and my daughter LOVED it. We had the normal sound machine too, but I really found this thing useful. My older daughter currently uses the Britax Advocate and we’ll be passing it down to her little sister in a few months so I want to get her a harness-to-booster car seat. I love how the crotch buckle on the Advocate sticks forward. Does anyone know if that’s the case for all Britax car seats, and/or know of any other car seats that have that feature? Her second car seat is the Cosco Scenera and digging out the crotch strap every day is the biggest problem I have with it. It’s called the EZ Buckle and is not included on all Britax seats–notably it is excluded on their new “Essentials” line. We had some weird electrical issues that scared us about having an electrical fire (electrician came and fixed everything, so hopefully we are good now), so I decided to teach my 5 year old about fire safety and what to do in case of a fire. I can’t believe I haven’t done it before. We also didn’t have smoke alarms in all bedrooms or CO detectors in the house. DH and I feel a bit irresponsible. Was wondering if anyone had thoughts on other safety related things with small children in the house? Our local fire dept does trick or treating at Halloween and handed out fire-safety coloring books. They also had this trailer that simulated being in a smoky house and teaching kids to crawl to the exits but my LO was way too young for that. However I did point out the coloring book a lot and read it to him, and plan to do this every year until he gets into school (when I assume they have a fire safety day). We have smoke detectors in every room and CO on each floor, since we’ve moved in. DH is big on safety so he managed all that. We also installed a Nest cam outdoor and a Nest security system. Beyond that, we have the normal gates and outlet covers and stuff. The only extra thing I’d like to do is secure all dressers/bookcases in the house to the walls. Right now we’ve only done the ones in his room, but all it takes is five minutes alone in the living room with the bookcase and me dashing out to grab the mail or something for disaster to strike. We have started teaching our children about gun safety. We don’t have any guns and don’t encounter any on a regular basis, but in the off chance that one of our children goes on a playdate and encounters a gun, we want to be crystal clear about what to do (immediately go tell a grown up). Yes, we do this too. My K boy is very into playing with fake weaponry, and at least once a week I remind my kids that guns are not toys, real guns kill people and then people who love them never get to see them again and are very, very sad. You never point a gun (even a fake one) at anyone, ESPECIALLY in public because people might get scared and hurt you if they think your gun is real. If you ever see a gun that isn’t one of your toys, even if you think it might be a toy, leave immediately and tell a grown up. Don’t touch, don’t stay if your friend wants to look at it, just gtfo. Also, I have a hard line on realistic-looking toy guns; something that needs an orange tip to visually distinguish it from a real weapon is not allowed in my house. We do have a real pistol in the house, but it is unloaded, locked in a safe with ammo locked separately, and in a part of the house where kids are not allowed. Kids know it exists (but not where it’s stored), know that dad will teach them how to use it safely at the shooting range when they are older, and that it is strictly off limits except under adult supervision. My son turned the tables on me the other day and asked what I would do if he told me about a gun. Fun times. Good for you for handling this! We talk about fire safety in pretty general terms, but not to the point of running fire drills at home or anything. Kids know what the smoke detector sounds like and that if it goes off, they need to get out of the house & meet us in [neighbor]’s yard. Do not hide under the bed, do not save the cats, do not save your stuffed animals, just get out of the house. They also know that if they see fire, they need to yell to everyone and get out of the house, not try to put it out. Fire extinguishers are only for grown-ups (we’ll qualify this when they are big enough to use one). The one thing that worries me a little is that their bedroom is on the 2nd floor and our bedroom is on the main floor. If the stairs are impassable, I am not confident they can open their window. I’ve told them that’s their alternate exit and showed them *how* to open the window, and they’ve tried it a few times, but it’s hit or miss whether they can get the push-upward motion with enough force. Daycare and their gymnastics class (!) have taught fire safety and about crawling to avoid the smoke. This isn’t *in* the house, but we’ve spent a significant amount of time teaching our kid about safety outside. Here in the SEUS, that means that he knows that there are snakes and crocodiles (alligators) in any body of fresh water in our area, including the ponds at the park, so he cannot swim in them. And he knows that if he sees a snake, he should walk backwards away from it and find a grownup. Lately, we’ve seen a lot of ant piles, so he’s learned to not step in ant piles and is a little obsessed with the idea of fire ants. Obviously, adjust for the most common hazards in your area. I have to admit I was pretty eye rolly about all the safety requirements that must be in place before you accept a foster placement, but they have been invaluable, especially when we have friends with small children visit. The things I found most helpful: guns and ammo must be stored separately and locked (this may not apply to you but we live in TX) – going to second the comment to teach your kids about gun safety. Kitchen knives (and alcohol) must be stored four feet above the floor or in a locked cabinet. Smoke detectors are required in every bedroom – you must post a fire evacuation route where each family member can see it and you must perform a fire drill every month. You must have all electrical plugs covered. There are more but these were the most relevant/helpful for us. Also, yes to securing all bookshelves to the wall; not a foster requirement but a necessity for small children. How is a fire evacuation drawing a requirement but not securing bookshelves to the wall?? Either 1) there hasn’t been a reported incident involving falling furniture or 2) they realize not everyone takes toddlers and don’t think this is an essential requirement. Some people foster teenagers so that would be a sort of silly requirement to implement across the board, although I think it’s more likely the first reason. 5 is a good age to teach them their parents’ first/last names, phone number and their address. Also, point out the neighbors where they can go to and knock on the door for help. Tip for this – Write your phone number (or other details) on masking tape and stick it to the back of your headrest in the car. Fun-ish way to help with memorization. Just a big shout out for CO detectors, which you and others have discussed. We had a small fire in our home in November. I was the only one home (WFH) and smelled it right away…called 911 and got myself and our pet out in plenty of time. However, standing in the driveway, I heard our CO detectors go off before our smoke detectors. We also had friends who had some kind of leak in their apartment and their landlord had either not installed detectors or they weren’t working. The wife actually passed out and the husband found her – it was before they had kids, so I shudder to think what would have happened with a tiny baby there. And just a PSA that CO detectors only last about 5 years and should be replaced after that. Mine is too little for this right now, but I’ve heard that you should take your kid to meet firefighters in full dress so that if they ever are in a situation where a firefighter is trying to take them out of a building, they will not be scared of the outfit/mask/hat and run away. One thing we haven’t done, but I would like to do (although our condo may be small enough that it’s less of an issue), is hardwire our detectors so they are connected to each other. Right now we have battery operated ones. The one in our bedroom isn’t going to go off just because the one in our kitchen is going off, it would need to be separately triggered. But from a damage prevention and getting out quick standpoint, much better to know about a fire downstairs before it triggers your detector upstairs. we just invested in a six pack of nest smoke/CO detectors. really $$$ but worth it. Our 5.5 year old son has recently begun wetting the bed after about 2 years of being dry overnight. It started out as once a week or so but is gradually picking up to be about every other night. It’s only a small accident (usually only gets his undies and pjs wet, the sheets and blankets are still dry). Thoughts about how to address the problem? Is this something that will resolve itself if we give it a little more time? This could be a symptom of constipation – so make sure he isn’t blocked up. Alternatively, it could be anxiety – has anything changed in his life recently? It could also just be age-appropriate behavior post-holidays and getting back into the regular routine. My stepson goes through this periodically and it lasts for a week or two, and like you said, it’s just a small accident. Has there been a recent change in routine? Is he drinking a lot later in the day and not so much at lunchtime? Does he have a new caregiver? Could he have a UTI? Starting after being dry for years plus it being more than just one or two times of having an accident would lead me to want to figure out the cause. No change in routine, which is part of why I’m mystified. The pediatrician has told me before that UTIs for boys are extremely rare since the anatomy is different, but will definitely try keeping an eye on constipation/if he’s not drinking enough during the day and too much when he gets home. I’m guessing this has been discussed before, but here it goes anyway. How long is too long for a road trip with a 1 year old? At what point does flying become better, even if a layover is required? We are trying to arrange a family get together with siblings and their kids, but everyone lives so far apart (Midwest and West Coast) that figuring out a location has been a nightmare. IMO, no such thing as too long of a car trip for a 1-year-old, especially if you’re talking about a layover. You’ll need to stop every 2ish hours and let kiddo run for 20 min, but really, this is not a big deal unless you’re talking more than 2 consecutive days in the car. This, although if it was more than 8 hours of drive time, I would probably fly. My husband would fly if it’s over 3 hours of driving, but that’s his personal preference. Flying to me is such a hassle and at least driving the only people inconvenienced by (or subject to hearing loss from) tantrums is us. As a kid, we drove everywhere, including cross-country (4 10-hour days) when my mom took us by herself and we were 10, 6 and 4 (she is crazy, I would never do this). Adding in layovers get complicated, but we generally go with 5 hours or less we’ll drive, more than that we’ll fly. It’s an 8.5 drive or 1.5 hour flight to my in-laws (plus 30 minutes driving to/from airports) and flying wins every single time. I think it boils down to personal preference– My personal preference is unless you are going by yourself and have a very short connection (less than an hour), flying with one young child is much easier. Definitely easier when you have two adults to keep the kiddo occupied. I would absolutely fly over driving in almost any scenario where it is financially feasible. I have flown alone with my kid regularly, beginning when she was around 9 months or so, and it has gone smoothly all but one time (and even in that situation, when my kid puked her guts up while the plane was landing and then we both started sobbing, other people were super nice to me and it all worked out in the end). +1 for this for a child under 3ish, at which point screentime makes the car more bearable. I say this as someone who spent half my childhood on I-95. I may have a weird kid, but flying is a LOT easier for us than driving. She hates being in her carseat. We just flew to and from Hawaii (~14 hours total transit time – a 2 hour flight, a short layover, and a 7-8 hour flight, plus driving to the airport and waiting there) and it was really fine…she didn’t sleep much and got a little hyper from the sleep deprivation, but there were no meltdowns. Car rides are really really challenging if they’re over about 2 hours because she just hates being confined to the seat so much. We also have to stop to feed her constantly (she doesn’t like taking bottles when she can see the b00bs are right there) whereas on an airplane I can nurse her while we’re in transit and it’s a lot more efficient. We fly anywhere we possibly can, even if it involves a layover. She’s 11 months and crawling but not walking. I have family members who spend their summers doing seasonal work 18 hours away from where they live the rest of the year. Every summer, they drive 18 hours there and back–now with 2 small kids and a dog. DH and I drove 8 hours with a 2 year old last year to visit family, and it wasn’t bad at all. For me, 10 hours of driving is on the cusp of doable for vacation. With a kid, that’s one full day in the car because you do have to stop every few hours and let the kid run around. Plane vs car depends on a lot of factors for me–how expensive the flight is, whether there’s a direct flight, whether the layover is in a hub or other large airport, how long the drive is, how far the airport is from your destination and what your transportation options are when you get there, and whether there’s another adult to share driving and kid duties with me. In general, if our family of 3 is traveling together, I’d take a one-day (10-12 hr) drive over a flight that will take 7-8 hours door-to-door. Sometimes, the answer is to not go. Last summer, my husband and I were invited to his cousin’s wedding. The wedding was in a small town that we were not familiar with. Our travel options were (a) 15-hour drive, (b) 2-hour direct flight into Large City + 3 hour drive, or (c) flight with layover (6-hour trip time, with an uncomfortably short connection with a toddler) + 1 hour drive. This would only have been a weekend trip. Our choice was for my husband to go, and for me to stay home with our kid. I (and my preschooler) prefer to fly, but my husband likes road trips. We typically fly because we want the kid to be happy, but then you’ll need to either rent a car or figure out transportation at your destination. We did a road trip with my daughter when she was 7 months old, and we took turns sitting in the back seat to play with her or give her bottles. We stopped every few hours to get out and do things. Despite my preference to fly, if the government isn’t open by the time your trip starts, I would drive. The TSA situation is getting really bad. Counterpoint: I literally flew yesterday out of a major airport and it was completely fine. I think the media sensationalizes many things, including this. I would allow some extra time but not hours (maybe extra half hour for a domestic flight). My personal limit is 8 hours. If we can’t drive there in 8 hours, we are flying. The fire question above reminded me – Does anyone else ever worry that you or your kids would not be able to find your cell phone in an emergency (or that it wouldn’t be charged)? Back in the day of land lines, I can remember learning how to call 911 from a very young age. I never had to, thankfully, but I felt good about knowing what to do in an emergency. I’m not sure how that translates today, though. Does anyone keep your cell phone always in the same place so your kids could find it if they needed to (seems like it should be easy but not super practical)? Has anyone gotten a prepaid phone or landline specifically for emergencies? Or is this all kind of silly and paranoid? This is a great point. We do make a habit of keeping our phones on the same place on the counter when we are home (for sure our work phones are always there). We keep a “landline” (really an internet phone through the cable company) for emergencies and because cellular signals are unreliable inside our house. The internet + cable + phone package isn’t really any more expensive than internet service alone. If you go this route, be aware that the phone won’t function during a power outage unless your cable modem has a battery backup. My kids always seem to know where my cell phone is better than I do, but getting to the emergency dial screen and successfully using the touch pad is probably not something they’d be able to do in an actual emergency. this actually was a real issue for me — a few months ago I got locked in the bathroom while alone with my 2.5 year old and (mobile) 6 month old (it’s an old house and the doorknob had fallen off the door that morning, then the 2.5 year old slammed the door shut while I was in there). Because I always keep my phone in the same place, my daughter was able to go get the phone and slide it under the door to me. I was able to call the neighbors, who had a key, and they came and got me out. This is why we have a landline. I have it set up with pictures of people next to each speed dial: fire/police (911), grandma, grandpa, neighbor. My oldest can read but I do pictures only because i figure she’d panic. Our alarm keypads (we have 3) each have a button that will call fire, ambulance or police. We got that version because we don’t have a landline. And we have shown the kids how to use them. We have a landline with a corded phone on the main floor in our main living space. My kids have serious allergies, I’ve had to use the epipen at home before and I’ve had to I didn’t want to be searching for my phone and/or charger in an emergency. Added benefit is that I rarely get spam or junk texts or calls to my cell phone because DH and I use the home phone number (w/answering service) for online shopping forms and never give out our cell numbers except to family and friends. Yes – landline with a corded phone, because there won’t always be electricity/internet. It costs something like $30/month around here. We cancelled our landline when it went up to $90/month for the absolute cheapest service, but it was an agonizing decision. Ladies – How do I psych myself up for labor? I’m 38 weeks pregnant with my second and exhausted, a bit overwhelmed and stretched pretty thin. I was so prepared for my first (mentally, physically, logistically). I just feel overwhelmed thinking about the actual labor. In actuality the logistics are pretty much in place for labor (bags basically packed, care for toddler secured). How do I get myself mentally ready? Anyone have a pep talk for me? Can I go from being an exhausted frazzled mom to doing this big thing? You’ve got this. Once labor starts, you will be totally focused and all the other things that are stretching you too thin and making you feel exhausted and frazzled will melt away. It’s just not possible to think about anything else while you’re in labor! Absolutely! You’ve got energy reserves, hormones, and millenia of biology on your side. Your body may surprise you. You’ve got this! For some lighthearted fun and to take away from some of the overwhelm, check out the youtube videos for the Baby Mama Dance. I was cagey and restless and scared before the delivery of my third baby (just a couple weeks ago!) and a friend recommend this to me. I got a good laugh watching these videos with DH and trying to make him dance along with me. Google birth affirmations, find some that speak to you, write them on post its and then repeat them to yourself, my favorite was something like “labor cannot be stronger than me, because it is me”, and “I can do anything for a minute.” I also listened to lots of episodes of the birth hour podcast. You can totally do it, your body was made for this and has been preparing for this. With my first focusing on the baby didn’t help much, but I think that totally would with my future babies! Just want to say thank you regarding the birth affirmations. I posted about a month ago and you mentioned the “labor cannot be stronger than me” affirmation. I used this during my labor along with some other words, phrases and images and rode out the contractions like a champ- I was so zen in fact that our doula and the hospital staff did not even think I was in labor until the machines and an exam confirmed I was in transition! Not sure how you want to approach labor, but it comforted me to know I could always opt for an epidural. Once I had an epidural, I was able to nap, which helped me conserve energy for when it was time to push. Giving birth was something I always really feared, but it turned out to be much less overwhelming than I thought it would be (due to the epidural). Plus, whether or not your choose that route, remember that you’ll be surrounded by competent medical professionals who have helped people like you a million times before. Good luck!! +1 Having an epidural so I wasn’t exhausted coming out of labour/delivery was so important with the second baby because I needed to be able to care for my 2 kids afterwards. My 4-year-old is a bit knock-kneed and flat-footed. It’s not a serious issue, but the ped says shoes with stiff ankles would be helpful. Any recommendations for brands? Also, does anyone by any chance have a recommendation for a kids’ shoe store in Northern Virginia or DC? I liked getting my kids fitted for shoes and buying them in an actual store, because it’s really hard for me to figure out their sizing and understand how well shoes I buy for them online work, but the kids’ shoe store near me closed. Fit Right Kids Shoes in Chantilly – it’s worth the drive – we drive there from Great Falls, but I’ve run into families from Arlington and Alexandria there as well. The gentleman who works there isn’t very good IMHO and routinely tries to put my kids in the wrong shoes (fit, style, etc. ), but the two women (one of whom owns it I think – Pam maybe) are excellent and they always come by and straighten things out when I seem unsure or waffling about what he’s telling me. Oy, I remember now that this was the only place I had found in my online searches previously — I’m in Arlington and this is a long way to go for shoes, but maybe it’s the best bet! You could also make a day of it – head out and get shoes in the morning, early lunch, afternoon at the Udvar Hazy or Frying Pan Park if it’s nice out, etc. For us we’re in the toddler stage of new shoes every 3 months or so, so I just consider it a quarterly field trip. Love this place as well! Just get there when they open on weekends. There’s also Shoe Train in Potomac. Unfortunately I think these are the only kids shoe stores in the area. Shoe train has long lines (I hear). Fit Right IS a long way out – but your kid only gets one pair of feet. Buying good shoes sets up their feet for life. I’m not generally one to criticize pediatricians because they have a million times more medical training than I do, but after working for Stride Rite for five years in the early 2000’s while in college, I heard from parents about a lot of outdated advice from pediatricians regarding kid’s feet. I might seek out a second opinion from a physical therapist for kids or an occupational therapist. My general understanding is that stiff shoes and ankle support can worsen foot issues. Barefoot is best and barefoot in particular can be helpful for developing arches in kids. But your child’s foot issues may be particular to your child though. I’m just putting that out there in case it would be helpful to get it checked out by someone with more specialized training in children muscle development. Ramers Shoes on Connecticut Ave in up in Friendship Heights/Chevy Chase is great! Can you help offer ideas and suggestions to get through solo parenting in the evening with 3 kids? Details: Husband works evenings and Saturday mornings. He is technically on call but gets called pretty much every evening and Saturday morning. We have a 3 year old, 18 month old, and newborn. He is on paternity leave now but goes back to work at the end of the month and I’m dreading the evenings alone. I’m currently nursing and pumping for the newborn to get supply up. 3 yo is independent but a picky eater. 18 month old wants to be carried and is a bit handsy with the new baby and breast pump parts but is otherwise adjusting well to the new baby. 18 mo old goes to bed at 8, 3 yo at 9. The toddlers are in daycare and can be picked up any time before 6:30pm. No family help nearby. This must be doable because there are moms that have the kids all day that do this, and I’m only looking at evenings right?? But evenings include a meal, baths, and bedtime–that’s hard! Plus possibly tired and cranky kids. Oh, and witching hour for the newborn. Hugs! Maybe look for a student to hire to help you in the evenings at least a few nights a week? I did exactly that for a mom whose husband was frequently on call or working evenings, and she only had two! The student can handle dinner (or at least clean up), bathing the 3 year old, and generally tag teaming so that you can get a bit of “quality” time with each one. I am still super close to that mom and she wistfully tells me about sitting on the couch in the front window waiting for me to show up each afternoon. Because people ask: She found me via word-of-mouth as a babysitter and it developed into a more regular role over time. What time does your husband start work? Can he prep dinner so it’s ready for you when you arrive home, going so far as to plate it up? Can you get extra pump parts so your husband can get them washed in the am? That sounds incredibly hard. I can barely handle watching my two alone at any one time, much less do the whole evening routine solo. Second hiring someone to come help you in the evenings – if possible, could they pick up the kids from daycare and get dinner started? Alternatively, they can play with the toddlers while you deal with baby and dinner. Longer term, if it were me, I’d be discussing whether this was a susatainable job for husband. A few occasional late nights might be ok, but him working every night and weekend morning would just not work for our family with small kids. Does it get easier once the kids get to a certain age? I’m going to be in the same position, but with a 2 year old and newborn come summer time. I’m hoping by the time baby turns 6 months and toddler turns 2.5, I can manage evenings by myself? How do SAHM’s do it?? It gets steadily easier, but the tipping point is more like 1 and 3. In my experience, 2 year olds are still pretty prone to unintentionally injuring little babies, mostly because they don’t understand their relative size and strength. 1 and 3. that’s where i am right now-ish. I keep being shocked at how hard it is (i’m also alone at night with them). I don’t understand what i’m doing wrong. Consolidate bedtime for the older two kids. They can bathe together (you can sit next to the tub holding the baby and supervising), listen to stories together, and go to bed at the same time. Staggered bedtime is extra work you don’t need right now. Also, it is totally possible to nurse an infant and read bedtime stories with a kid sitting on each side of you, or sitting next to each other with one of them holding the book. “Read” books that you have memorized. Easy dinners. Things you can microwave or bake without any further interaction (assuming you are home on maternity leave, maybe make it during the day when the kids are at school and reheat at dinner time). Crock pot meals. Unless your kids are having growth issues, don’t worry too much about picky eaters. Serve dinner, and tell them, you get what you get, and you don’t get upset. Let the older kids watch Daniel Tiger or similar if you need to deal with dinner or the baby. Babywearing when at all practical for the infant. Also, be OK with putting the baby in the crib and letting him/her cry for a few minutes if you need 2 hands and full range of motion to deal with the older kids. If you need to pump, do it before the older kids come home and after they are in bed. Seeing something happen where you need to intervene but being attached to a breast pump is…. frustrating. Mine were a little more spread out (0, 2, 4), but I agree with all of this. (I only had to do it while my husband traveled, though, not every night.) . My older two have had the same bedtime basically since the baby was born. Picking them up a little on the earlier side might help so you aren’t trying to cram everything into a short timeframe. Everything that can waits until after bedtime. My newborn went to sleep after the older kids went to bed, but maybe that was just me. My husband bathed all three together – baby in the tub and one kid on either side. But I never did. not sure how much pumping you are doing, but you could consider one of the portable pumps. baby carrying and using a swing/bouncer will be your friend. agreed that the only thing you should have to do for dinner is put something in the microwave. tis the season for frozen food and rotisserie chicken from the grocery store or even pb&j for dinner. good luck and hang in there! Wow, yes, this is hard. The handful of times I was alone in the evening with a newborn and a toddler were challenging — much more than during the day. I agree that you should look for help and/or evaluate with your husband whether this schedule makes sense for your family. The only way I would be able to maintain my sanity would be to let the older kids do half an hour to an hour of TV while I was putting the baby to bed. It will get easier, but will be quite difficult for at least another year — I wouldn’t do this regularly without help unless I really had no other option. – newborn eats right before toddler comes home from daycare and after toddler is in bed. During toddler’s evening routine, newborn is settled in her bassinet or in the ring sling if she won’t settle. – I bulk cook mac and cheese, cut into single servings and freeze. Toddler eats mac and cheese or a PB sandwich with raw fruit and veggies and a yoghurt every day of the school week. – Toddler bathes once during the school week and once on weekends. – I set out everything for bedtime routine in the morning right after toddler goes to daycare so I’m not running around looking for pacis or toothbrushes when I have no backup. – I have a few “emergency” toys in case I need to distract toddler and unexpectedly attend to newborn. They’re new toys toddler has never seen before for maximum distraction value – sticker books are great for this. I didn’t get a job I applied for. It was an internal posting, a bit of a stretch. My boss and grandboss gave me feedback, which amounted to we need to see more “leadership” but your technical skills are off the charts, so don’t worry about that. When I pointed out that the projects I’m on a currently are technically very complex, but don’t involve managing people (where I’m lacking leadership), I’m told that we need you on those now, but in the future you can ask for work to develop your leadership. This kind of makes me worried that I’m going to be stuck as the smartest analyst in the room, doing the grunt work, but get no credit because I’m not the leader. Just a bit depressed about it. Not the worst thing, but I’m also due to give birth in two months, so I really don’t feel like I can tackle this “opportunity” (as my boss framed it) with any sort of rigor right now. Maybe maternity leave can be an opportunity for you to shift some of your grunt work to other people who have to cover for you when you’re out anyway. When you come back, you and your boss can see where you might have room to take on more leadership projects and have some of the ongoing grunt work passed off to other people permanently. We are going to do 2 days of Disney in late April. Kids will be almost 1, almost 3, and 5. We’ve gone once before when kids were almost 1 and almost 4. We did one day of magic kingdom, until the parade, and the kids were beat for days (and both stroller napped). We are going to be visiting family for 4-5 days. We’d been thinking of doing Disney for 2 days- if that is reasonable, which parks? 2 days at MK? One elsewhere? My kids would love the frozen stuff at Epcot but I’m not sure enough to justify a whole day there. Animal kingdom? And 3 days in Disney isn pushing it, right? 3 days isn’t pushing it! We love to do it leisurely. Kinda. So we rise at dawn To go to a park (because my kids rise at dawn every. Single. Day. ) do the park a couple hours, and a couple fast passes booked Btwn 11:30-1, and then return to the hotel for naps/pool time. Then around 5 we go back to a different park for a few rides and dinner. I would do 3 days! I’d skip EPCOT – maybe 2 days at MK and one at animal kingdom. For our 1 year old we just went to the parks until lunchtime, ate packed lunch, went back for nap, and then out for dinner (usually at a resort). It depends how flexible your kids are though. My sister took her 1/3/5 year old and they were all fine for 5 days with much more Park time than us. My kid is a stickler for a schedule though. Three days isn’t pushing it! I’d do 2 days at MK and 1 day at AK. I’d plan to arrive early and either leave the park for good around parade time, or leave the park at lunch time and return around 3 or 4 for a few hours. We have been to Disney during April the past 3 years (when Kiddo was 1, 2, and 3). For MK, we get Fast Passes for (roughly) 9, 10, and 11 am, arrive around 8 am, do about 3 rides, have a snack around 9:30, ride 3 more rides, have lunch, and peace out for nap time. Some days, we return to the park in the afternoon (you can get a 4th Fast Pass after you use 3, plus you can watch the parade or a show and ride/see things that don’t require a Fast Pass (steam train, carousel, Swiss Family Robinson tree house, Philharmagic), and some days we go to the pool. We have an early dinner, take our kid back to the hotel for bath and pjs, and let him watch the fireworks from the hotel if he’s ready for bed at fireworks time. You’d have time to cover a lot of rides geared toward young children with 2 days with 6-7 hours in the park. Animal Kingdom can be a lot of fun with kids. Mine enjoyed the safari, some of the shows, seeing the animals, Rafiki’s Planet Watch (train + petting zoo), and the boneyard. I’d also snag a Fast Pass for just the adults to Flight of Passage (or bee line there at opening) and then do the family rider switch. I don’t think the Frozen ride is worth justifying a whole day in Epcot. There aren’t many activities for small children in Epcot. Anyone still battling cradle cap around age 1? My 11 month old has it pretty bad, and she has a ton of hair, so it’s hard to get to her scalp to scrub it effectively. We have tried medicated shampoos/creams as well as home remedies like the cradle cap brush and olive oil. We’ve tried washing her hair every day, and also going long stretches (7-10 days) without washing it. Nothing seems to really make any difference. I realize this isn’t a serious medical problem, especially since it doesn’t seem to be bothering her, but I’m starting to worry it’s never going to go away. Did anyone’s kid have it this late and still have it go away on its own? i feel like i’m still battling cradle cap at 41 for myself. kidding. kind of. I feel like my five-year-old just got over it, tbh. The Mustela cradle cap foaming shampoo is the only thing that works for us.